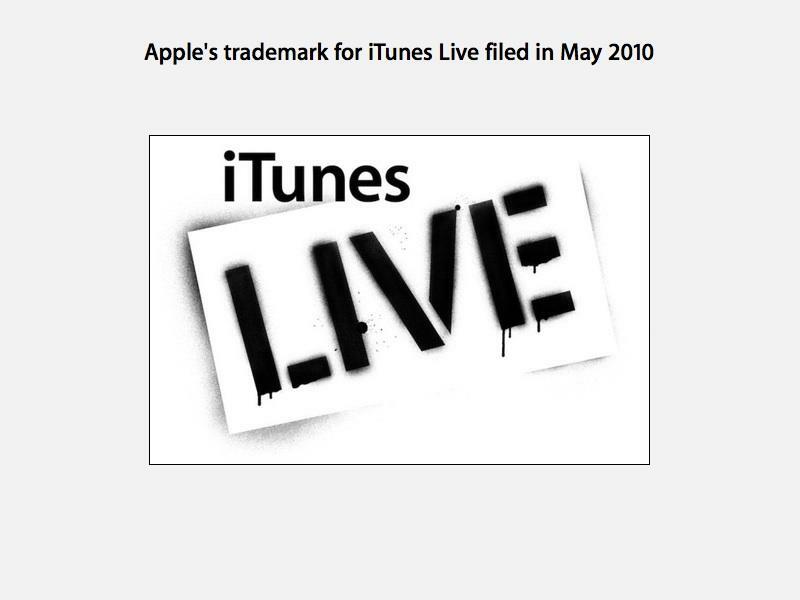 A text label for "iTunes Live Streaming URL" discovered in iTunes 10.1 suggests Apple's announcement tomorrow will indeed launch the iTunes Live brand it trademarked earlier this year. The French blog "Consomac" first noted the "iTunes Live Stream URL" label buried within iTunes' localized text strings. In May, Apple trademarked the brand "iTunes Live," leading to speculation it would launch a live streaming service, likely based in part on its Lala acquisition. However, Apple's ability to launch its streaming media service--long believed to be a cloud storage solution for users rather than a subscription service--has been held up by negotiations with labels, who want additional licensing fees from Apple for allowing users to play back their own music from Apple-hosted remote storage. The same problems have held up Google's efforts to host users' music in the Cloud. Both Lala and Europe's Spotify were able to make music streaming deals with the labels, but a condition of their contracts made the deal worthless if those companies were ever acquired. AppleInsider first noted that Apple had begun working to add a hosted, steaming music, movies and TV service to iTunes back in February of 2009, under the name iTunes Replay. More than a year later, Apple was again reported to be working with the studios and labels to deliver a streaming iTunes product, then expected to arrive in the third quarter of this year. By July however, reports of Apple's difficulties in negotiating terms with the labels indicated that such a service was not "imminent," and that while "industry insiders said Apple has indeed engaged in discussions with the music labels," it was also said that "the record executives haven't even seen all the details yet," and that no deals appeared ready to close. A Wall Street Journal report in late April stated that Apple's negotiations hadn't made progress "because the labels argued that streaming a single purchase to multiple devices constituted multiple uses, which meant they should receive more for the songs they sell through iTunes." A new report continues to cast doubt over Apple's ability to reach a deal with the studios and labels that would enable it to operate a live streaming service for users. However, the company appears determined to do it anyway. In May, Apple filed to trademark the brand "iTunes Live," describing it as "online retail store services in the field of entertainment featuring prerecorded musical, audio and audiovisual content." The graphic logo Apple included in the trademark application appears below. Tomorrows' iTunes announcement, scheduled at 7 AM PST, is unusually early for the company's usual events, suggesting that the news may come from the East Coast where Apple's new North Carolina data center is located.